I've been working on some Christmas / Holiday / Winter projects of late. Our last two card workshops were all Christmas / Seasonal cards. But first, I'd like to show you a decor piece I've made for myself. I've been on an ornament kit this year too (not for the holidays but for another, future, secret project). While working on them, I bought extras to make snow globe scenes. I really wanted to do the ornament version, but I thought, why not try my gable box? I made an acetate gable box. Then I lined the inside with the blue snowflake paper. I lined the outside with a silver embossed snowflake paper. Inside the box window I created, I spaced out 4 layers of snowy hillsides with Stardust Stickles glitter glue on their edges. Then, I added my hillside fixings: a stag (Cottage Cutz), Evergreen Trees (Quickutz) and little houses (my own die cut design on my Brother Scan'N'Cut). It was not easy to work with the acetate. This display is staying home with me, as I am unlikely to make another! I opened the top of the box and dumped in some fake snow. It's like shredded cellophane with a nice sheen. What holiday crafts have you been up to? What ones are on your bucket list? There has been a flurry of challenges to kick start my creativity lately. Both my sister and I picked up some snow themed stamps by High Hopes Rubber Stamps at Scrapfest Richmond Hill from One Crazy Stamper's booth. My version is Snowman Pile! I really wanted to colour it with pastel shades, but I don't have that many. So, to get this look, I combined Copic Markers, Bic Mark It Markers AND Letraset Tria Markers! Just like what's depicted in the image, it was really a group effort! Also at Scrapfest, we did some water-colouring at a Make'n'Take. Water colours are not my strong suit, but I always wanted to try the random watercolour background effect, so that's what I did on this card. I smashed 3 different blues on to my Ranger non-stick craft mat, one at a time, spritzed with water and then smooshed my water colour paper into it, drying with my heat tool in between smooshes. This artist has really cute images. I love how well it captures movement with the big smiles and flapping jackets. What a cute image! I'm entering this into High Hopes Rubber Stamps October 2015 Challenge for Christmas/Halloween/Fall as well as Virginia's View Colouring Challenge. Virginia's View always has mega amounts of participation and I always find great designers and blogs through that site. My sister has entered the High Hopes Challenge too. Her snow people version is from the High Hopes newest release. 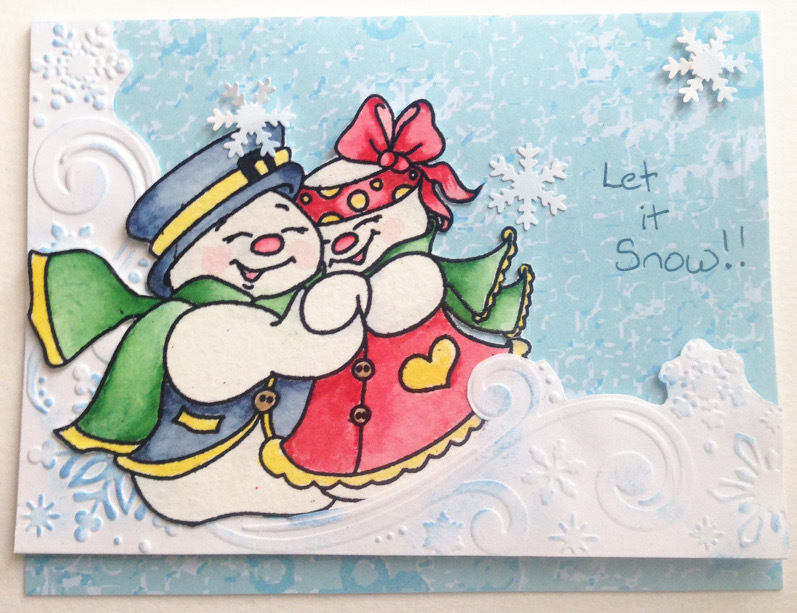 The stamp image is called Snowy Couple. She water coloured her image and also embossed her card (the white part). She partly fussy cut the embossed portion to tuck the snowman couple in it. I'm keeping my card for my personal holiday stash - yes it's time we got started on that! Have you started prepping your Handmade Christmas things? Today I'd like to show you a recent workshop project of mine: cards in a box! I really like this style of card. The added dimension creates lots of ways to work with it. The vertical versions are fun too but provide only a tall, skinny spot for your message on the back. So, I found a horizontal one but wasn't thrilled with the dimensions. So I calculated measurements that I found easier to work with. With one sheet of 12 x 12 cardstock, plus some scraps for the inside benches that no one sees, you can make three of these cards! This is my original sample: Balloon Birthday card in a box. I design mine with a pocket for the sentiment on the back. That way, if I mess it up, I can just toss it and do another without having ruined my card. After making this one, everyone could make another with their own materials and my instruction sheet. Here's what they came up with! First up - Norma made a birthday card for a family member by cutting out party hats from a scrap piece of patterned paper. And Debbie made her card for a wedding by using a few different sizes of heart punches. They both turned out amazing! Don't you think?